I’ve never been much of a sunglasses guy while running. In fact, I always found them quite irritating and distracting, as they would either slip down my nose and threaten to fall off, or the lenses would steam up. And let’s face it, when I’m thinking about essential running gear (shoes, clothes, water), sunglasses don’t really come to mind. 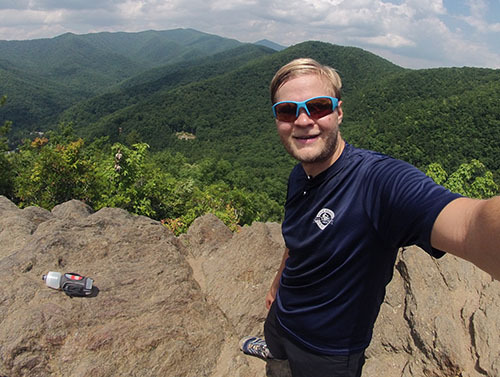 So when Julbo approached me to test out their glasses, I was a little skeptical. But hey, I see sunglasses (often Julbo, actually) on many of the pros, so there must be something I’m missing, right? I took them up on the offer in order to find out for myself. 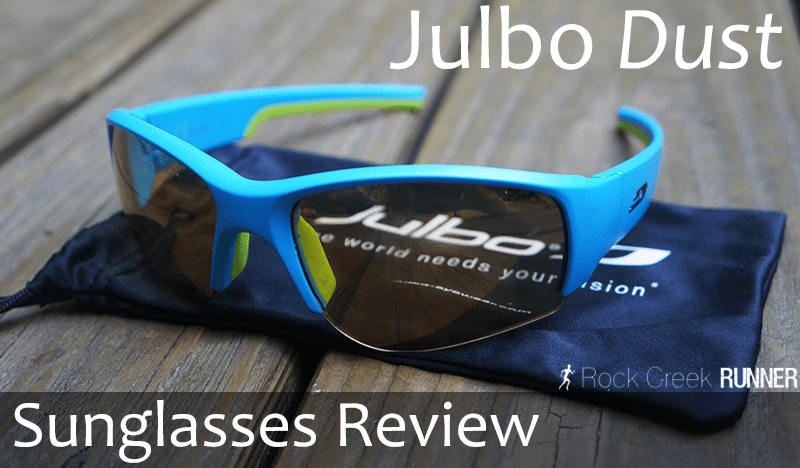 Note: Before we get too far into this review, it’s important to note that while the glasses were provided by Julbo, the company has no say or sway over what I say in this review, and they have not approved or reviewed the article before posting. So if they were complete rubbish, I would absolutely tell you. Fortunately, they weren’t. SPOILER! Drat. When the Julbo Dust ($99-170) sunglasses arrived in the mail and I opened them up, I had to laugh. “Bright blue?” I said to myself and snapped a selfie to send to my wife. I’m not usually one to wear bright colors, especially on my face, so I knew she’d appreciate my new shades. They don’t bounce at all. I can barely feel them on my head. First impression of their functionality was a great one. They were so light and the lenses so crisp that I barely knew I was wearing anything at all. The first morning of my recent running trip to Colorado, the guys and I were staggering around the trailhead parking lot in a 6 am daze, slowly getting our gear together for 7 hours on the trail. We gathered our food, layers, bottles, and everything else we thought necessary for a day in the mountains. That’s when I pulled out the Julbos, and as I put them on my head, they caught David’s eye. That about sums up the way I feel about the Julbo Dust sunglasses. About all Julbo glasses in general, actually. Their edgy look, sleek lines, and funky colors take it up a notch. Like I said earlier, I probably wouldn’t have picked the blue on my own, maybe opting for black instead, but now that I’ve been wearing them, I’m really starting to dig the vibrant tone. The color is fun, and makes me want to step it up a notch. It does mean that the adjustable lens blocks out harmful rays and glares, and lightens enough to where you don’t notice it when you don’t need the extra shade. It doesn’t mean that you’ll be like my friends in middle school, who when they had adjustable lenses and went inside, it took 10 minutes before they could see anything. It does mean that they don’t fog up, even when it’s humid and wet. It doesn’t mean they’ll make you faster. You may look like a pro, but you probably still aren’t. I had to learn that one the hard way. It does mean that the view through the lenses is crystal clear, and doesn’t hinder your depth perception when running on technical trail. Now, I do want to bring up one issue I had towards the beginning. If I wore the glasses tight up against my face, the top frame would touch my brow. After sweating for awhile, I noticed that sweat would build up and start to drip down the lens. After a little adjusting of how I wore the glasses, I was able to prevent this from happening, but when it does happen, it can be hard to see where you’re going until you’re willing to stop and wipe your glasses. As I said at the beginning of this review, I’ve been very impressed with the fit. There is virtually no bounce, and I don’t ever worry about them falling off my head. When going through darker, tree-shaded areas, or earlier in the morning, I tend to wear them on top of my head, either on top of my hat or tucked into my Buff. In both places, I haven’t had to worry about them falling off once. They stretch well, stay snug around my head, and don’t pinch my nose. Everything I look for in a fit. I will repeat here, however, that I was having the issue of the top rim touching my eyebrows and causing sweat to drop down the lenses. Like I said earlier, a quick adjustment of how I was wearing them, and that issue has since been resolved. As you’ve probably gathered, overall I really like the Julbo Dust, and I have no doubt that Julbo puts out some of the best performance sunglasses on the market. The Dust are no exception. They make me look like a badass. They fit well on my face. The lenses are crisp and don’t hinder my depth perception. And for the first time ever, I feel comfortable wearing sunglasses while running. Am I a total sunglasses convert? No, not really. I’ve found myself leaving them in the car at times. But that’s more because sometimes I like running as gear free as possible than it is because I don’t like them. I’d recommend the Julbo Dust to any runner looking for a pair of sunglasses. Just a heads up, I’ll be joining a group of bloggers, including No Meat Athlete, Fit Bottomed Girl, Skinny Runner, and many others at this year’s Runner’s World Half Marathon and Festival in Bethlehem, PA on October 18th and 19th. The festival includes a 5k and 10k on Saturday, and a half marathon on Sunday. I’ll probably be running all three, and would love for you guys to join in on the fun. If you’re planning to run, let me know! I’d love to see you there. Doug, these shades do look sweet. I took notice when I saw sponsored runner Ian Sharman wearing them. Hah — sponsorships work! BTW thanks for the RW coupon codes — I just signed up my GF and myself for the 10K! Hey Arun, ha! I guess they do! That’s awesome about RW. So glad you and the GF can run it. Hope to see you there! I will look for you and introduce myself! Cheers and happy trails.